As a youth, I lived on a steady diet of 1950's science fiction movies. But unlike my friends, I inevitably identified with the sometime scatterbrained but always brilliant scientist (usually referred to as "The Professor") who provided the science in "science fiction" and always got the answers rather than the muscle-bound hero who provided all the action and always got the girl. This page is a tribute to the real life prototypes who served as ready-made images for those "Professors" and through their imaginative work as scientists inspired and molded much of my life. Born Ulm, Germany. Died Princeton, USA. Albert Einstein has been a lifelong hero of mine. When I was 11 years old, I signed up to go to a Princeton-Colgate football game with my cub scout troop solely because I knew he was at Princeton. When the bus arrived, I stole away from my ever-watchful den mother and headed toward the observatory where I knew he had an office hoping against hope that I might catch a glimpse of the great man. As I wandered the campus, I spotted him turning a corner right in front of me. I froze in place as he approached. He seemed deep in thought and was unlikely to notice me standing in the path. Just as he was about to pass me, something pulled him from his musing. He smiled at me as I stared unspeaking and said, "Good morning young man." I mumbled, "Uhm... Good morning sir." And then he continued on his way. My eyes followed him until he disappeared around another corner. It was a moment I would never forget. I got into all kinds of trouble for leaving the group, an act of irresponsibility that only my mother seemed to understand. A year later, the great man died, but he lives on in my memories of that brief moment of our meeting some 45 years ago. 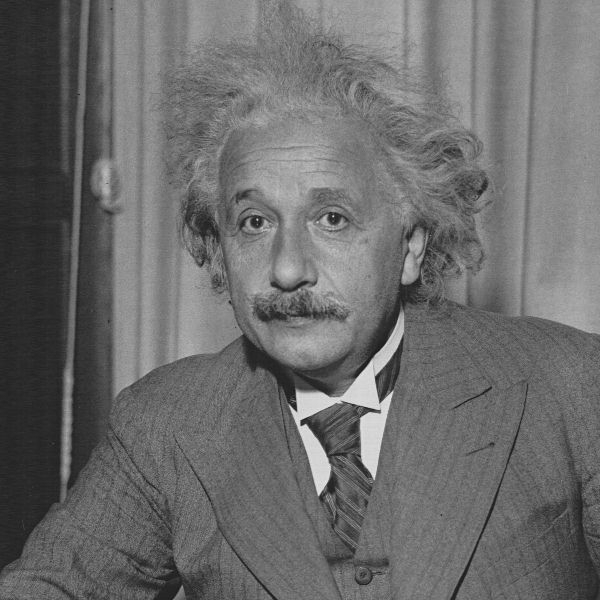 Albert Einstein first gained worldwide prominence in 1919, when British astronomers verified predictions of his general theory of relativity through measurements taken during a total eclipse. Einstein's theories expanded upon, and in some cases refuted, universal laws formulated by Newton in the late seventeenth century. He captured the world's imagination with his blend of brilliant scientific theories and humanitarian concern. Forty-five years after his death, the public is still intrigued by him. Visitors come to Princeton from throughout the world to see where Einstein spent the last twenty years of his life. Born Brooklyn, NY. Died Seattle, Wash.
During the airing of Dr. Sagan's 1980 television series, "Cosmos", my then seven year old daughter and I sat captivated through all 13 parts while one of the most accomplished popularizers of science explained the universe and its mysteries. The series covered some 15 billion years of cosmic evolution from the Big Bang to the origin of life and human consciousness. Carl Sagan's presentation of these subjects was so fascinating and comprehensible that "Cosmos" attracted an audience of over half a billion people in 60 countries. The book based on the series spent 70 weeks on the New York Times best-seller list, including 15 weeks at number 1. 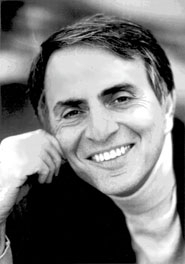 Sagan's career as a popularizer had begun in the early 1970s when he started publishing science books aimed at a lay audience and made his first of 25 appearances on NBC's "Tonight Show." His book "The Dragons of Eden: Speculations on the Evolution of Human Intelligence" won the Pulitzer Prize for Literature in 1978. He continued his work as a popularizer of science and critical thinking right up until the end of his life. Despite his fame as popular writer and TV personality, however, his main career was in Academia. From 1971 until his death Carl Sagan was Professor of Astronomy and Space Science at Cornell University. He also worked for NASA and was responsible for NASA Space Probes Pioneer 10 and 11 and Voyager I and II interstellar messages, and worked with the Mariner, Voyager and Viking planetary exploration craft. "My belief is that the explanations of 'emergent' phenomena in our brains - for instance, ideas, hopes, images, analogies, and finally consciousness and free will - are based on a kind of Strange Loop, an interaction between levels in which the top level reaches back down towards the bottom level and influences it, while at the same time being determined by the bottom level." Douglas Hofstadter is College Professor of cognitive science and computer science, director of the Center for Research on Concepts and Cognition, and adjunct professor of philosophy, psychology, history and philosophy of science, and comparative literature. His Pulitzer-prize-winning book Gödel, Escher, Bach: an Eternal Golden Braid (1979) had considerable impact on my thinking in many disciplines, ranging from philosophy to mathematics to artificial intelligence to music, and beyond. I have read this text at least a half dozen times and each time marvel at its content and presentation. The Tumult of Inner Voices or What Is the Meaning of the Word 'I'? "I would like to speculate a little, on the development of life in the universe, and in particular, the development of intelligent life. I shall take this to include the human race, even though much of its behavior through out history, has been pretty stupid, and not calculated to aid the survival of the species." Stephen W. Hawking has achieved international prominence as one of the great minds of the twentieth century. His popular work exploring the outer limits of our knowledge of astrophysics and the nature of time and the universe was inspirational. 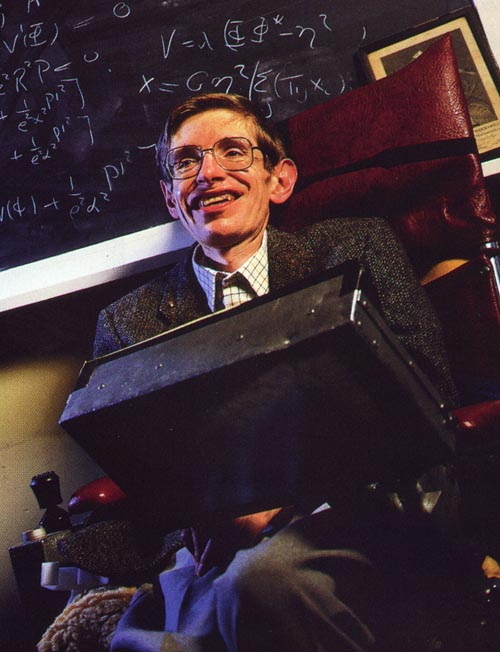 From the vantage point of the wheelchair where he has spent the last twenty years trapped by Lou Gehrig's disease, Professor Hawking has transformed our view of the universe. His groundbreaking research into black holes offers clues to that elusive moment when the universe was born. I have read and reread his "A Brief History of Time" and each time my admiration I wonder at the ability of the human mind to shine with brilliance even in the face of physical disability. In 1961, the Soviet Union exploded in the atmosphere a single three-stage nuclear weapon that was a 60-megaton bomb with explosive power equal to 60 million tons of TNT. That's ten times the explosive power of all of the bombs used in the whole of the Second World War, in one explosion. I was then an undergraduate student of physics and as such felt an ambiguous sense of shared guilt at the enormity of this destructive power unleashed by the science I had committed myself to pursuing. Science was important to me and I recognized its importance to civilization. but irresponsible science threatened to destroy that very civilization. Dr. Linus Pauling was the first voice of responsibility in the scientific community that I was to hear. Dr. Pauling had already won renown for his application of modern physics to the problems of chemistry when he took on the unpopular task of informing the public about the dangers of nuclear weapons. Pauling endured ostracism and ridicule for his uncompromising stand, but went on to win two Nobel Prizes: the 1954 award for Chemistry and the 1962 Nobel Peace Prize for his efforts to end the open-air testing of nuclear weapons. 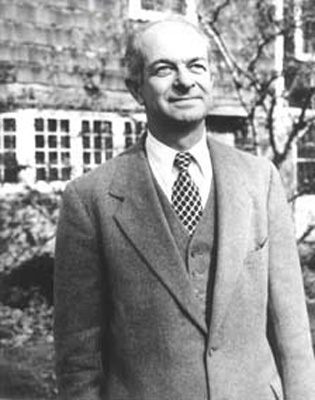 To the end of his 93 years, Linus Pauling devoted himself to the cause of world peace. Pauling's work as a chemist would have been sufficient to earn him an honored place in the history of science, but his humanitarian efforts made him a beloved figure around the world. "The vastness of the heavens stretches my imagination -- stuck on this carousel my little eye can catch one-million-year-old light. A vast pattern -- of which I was a part -- perhaps my stuff was belched from some forgotten star, as one is belching there . . . It does not do harm to the mystery to know a little about it. Far more marvelous is the truth than any artists of the past imagined!" "A problem confronts anyone wanting to tell Feynman's story: There are a number of Feynman stories, and Feynman himself has already told all the best ones." To say that there are a number of Feynman stories is an understatement. Anyone who tried to write at any length about Feynman without telling some of those stories would not be doing justice to the man. He really was a curious fellow, both in the sense of being perceived as eccentric and in the sense of approaching life with an insatiable scientific curiosity. But the perceived eccentricity was apparently just a consequence of the way he chose to live his life: He pursued, with a wide-eyed innocence, whatever subjects appealed to him, whether or not they were in his area of specialization, whether or not they seemed to others to be proper matters of scientific interest. He apparently actually lived his life by the motto that became the title of his second popular book: "What do you care what other people think?" Richard Feynman's "The Feynman Lectures on Physics," published in 1963 remains for me one of the most lucid explanations of physics that I have ever read.